As the digital landscape grows, user expectations have as well. Website users expect an easy-to-navigate website that clearly displays information and incorporates rich media for an engaging and entertaining experience. Gone are the days of waiting for a site to load or be patient while video buffers. In order to present the user experience your online visitors are looking for, your plumbing website must offer an appealing and functional user interface. Viewing your site from the eyes of your visitors can help instruct the design of a user interface. Testing and measurement is also an important part of the process, as without supporting data, one can’t know for certain how each visitor will interpret the design. As is the case with web design, in general, user interface should enhance the user’s experience and fit within the context of your larger internet marketing campaign. Call (877) 388-9884 for UI design for your plumbing website. Consistent: The site’s pages are uniform and resemble the same structure. Deliberate: Each component of your user interface creation should have a purpose and function. Simple: Your plumbing site should be simplistic and not overly busy or hard to follow. Keeping your interface clean and understated encourages a positive user experience. Interface design should not be performed on a whim, but should instead be planned ahead of time and executed with a strategy based on supporting data. 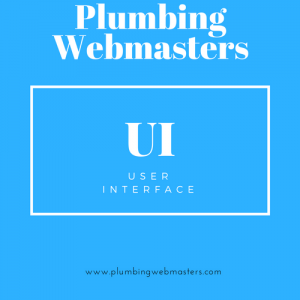 Plumbing Webmasters has the best design team in the business and can help you present a superior user interface for longer bounce rates and more conversions. Since most visitors will be accessing your website via a mobile device, its correlating interface is crucial. 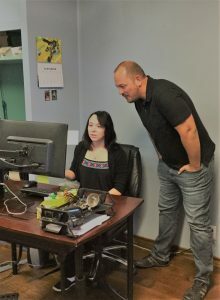 Through responsive web design, mobile UI can adjust to a desktop for the minority of users who choose to access your site on a computer while still delivering an engaging UI on mobile devices and tablet. UI requirements are different for the dimensions of a smartphone, tablet, or desktop monitor. Mobile UI includes considerations like swipability, homepage return, and call or email buttons that link to direct communication. The Plumbing Webmasters team delivers complete mobile user interface optimization to ensure that your plumbing website functions optimally, no matter what type of device the viewer uses. Plumbing Webmasters goes above and beyond with our UI design services. As a part of our overall internet marketing plan which includes SEO, PPC, social media advertising, and content marketing, crafting the perfect user interface is on the top of our list. With the goal of lead generation clearly defined, facilitating conversions through a highly usable interface can produce results at a formidable rate. Call (877) 388-9884 for UI interface design for plumbing websites. Updated on April 17, 2019 at 8:21 pm by Plumbing Webmasters.